Robert was born on 23 June 1815 at Preston, Yorkshire (nr Hull). He was educated at Kirkells, a village 5 miles west of Hull. Robert was converted in February 1834 and joined the Primitive Methodist society. He was briefley on the plan of the Keyingham Branch of the Hull circuit before being called into ministry in June 1836. For many years Robert was Secretary to the Leeds District Committee. He was recognised as having a wide and judicious exposition of connexional law. Robert was General Secretary of the Mission Committee (1869-1874), Secretary of Conference in 1868 and 1878, and President of Conference in 1875. 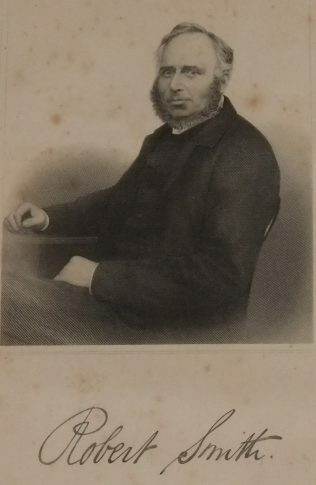 He was Governor of Elmfield College (1880-1889). In 1886 Robert became a Deed Poll Member of Conference. He held this appointment for 7 years until his health declined. Robert married Priscilla Gaukrodger(1810-1899) in September 1842 at Halifax, Yorkshire. Census returns identify six children. Anna Matilda Eastwood (1846-1929) – married William Johnson, head-teacher at Elmfield College (1886-1891). Previously married to a Summerscales. Robert died on 30 April 1897 at York, Yorkshire.